Certainly, passion today has a new name, i.e. tattoos, but geeks want something hi-tech to mark their zeal and here ‘digital displays’ for human body come into fashion. Digital displays are all the rage amongst freaks who want to stand out of the crowd. Implanted under the skin the digital dermal displays consists of billions of ‘light-emitting nanorobots’ that rearrange themselves to spell out words and numbers and produce animations for the display. A simple tap of your finger can easily control the touch sensitive displays. Initially, the programmable nanorobots act as bio-sensing devices reading out medical conditions of the wearer. The new ‘nano-skin’ polymer films are more flexible and thinner, are easy to implant under the skin, and have opened a new era of flexible screen displays. As discussed earlier, the new ‘digital ink technology’ used in permanent tattoos too has marked a new phase in the field of body modification. 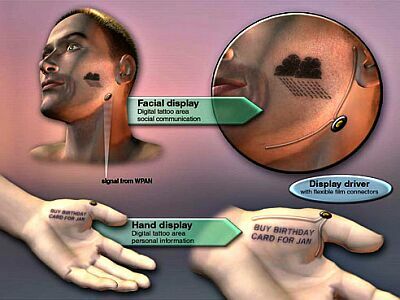 You can easily control these programmable digital tattoos via your PDAs, displaying relevant information as per your choice. The hi-tech tattoos display emotions, simple reminders, interests, disinterests and the list is endless.